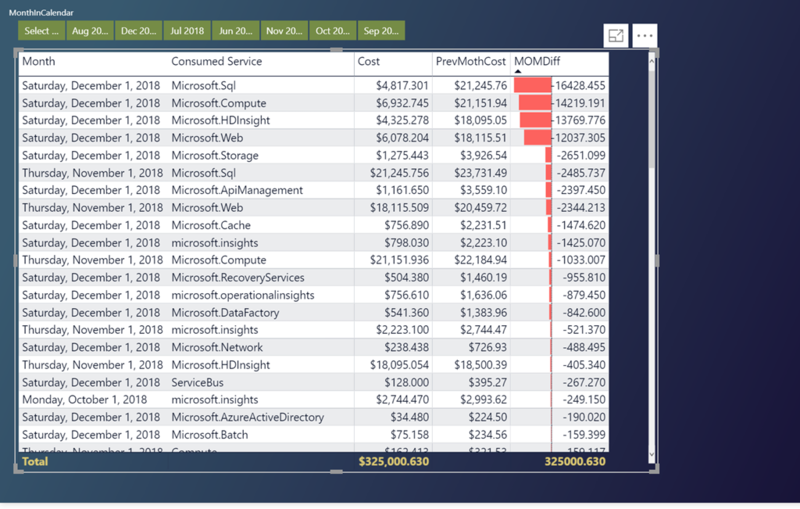 In this blog post I would get into details of using Consumption API to bring cost metrics into Power BI and we will be using Power BI capabilities for analyzing the cost. 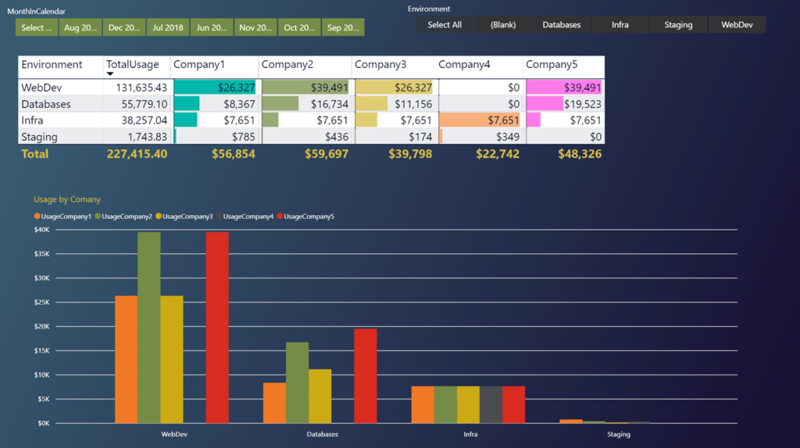 Power BI gives you the most flexibility when it comes to reporting and customization. In this blog post series I will get into MoM /YoY analyses, distributing the cost between departments / sub companies , custom charge back options etc. 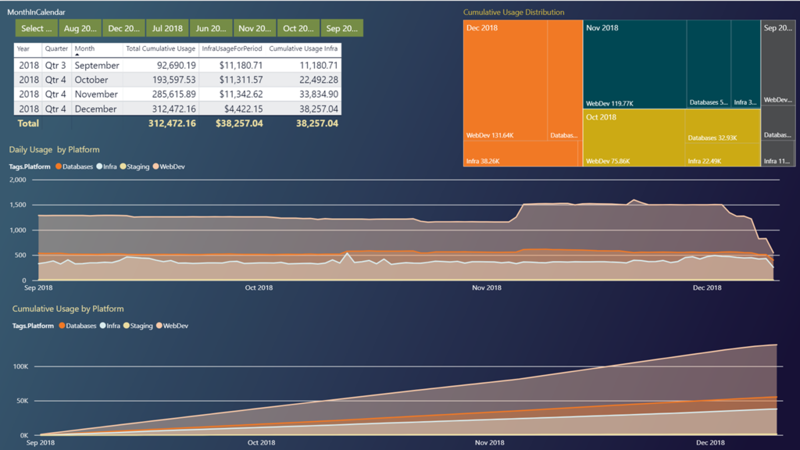 In part 3 I’ll focus on Month over Month / Week over Week usage analysis , rolling usage and distributing usage among departments/customers/companies or any other category we want. 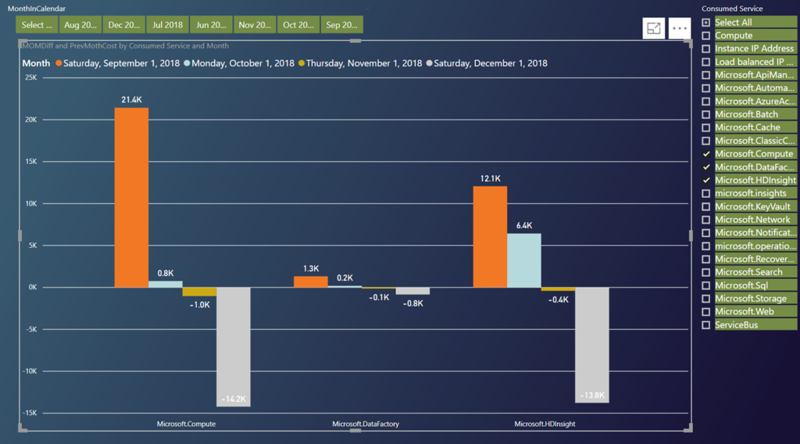 To calculate the Month over Month , Week Over Week, we can utilize measures in Power BI . Now we can use this measure together with Usage[Month] field to visualize increase/decrease in usage Month over Month. Note that Month over Month calculation gives us the right values only for completed months. You can use month slicer on top to remove last month from the calculation. This will sum up the cost for the dates before the current value . Now we can use this new measure instead of Cost field to visualize UsagetoDate. In some cases when we manage the EA usage , we need to show usage distribution for specific departments , customers or companies we host resources for. If those customers are sharing the resources line a single VM or storage account or a SQL instance in Azure , there is no built in way to distribute usage among those customers. Here first, I’ll show a way to distribute the resource usage using a static mapping table. For example, lets assume we share our platform to host workloads for 5 companies. By using a static table we will show how usage is distributed among these 5 companies. Repeat same for all 5 companies to show how usage is divided among these 5 companies . Just like static mapping we can utilize App Usage / SQL Record Counts / Transactions to estimate % of the cost distribution for respective companies / departments. For example you can use asset intelligence to count page view for the respective month and map it with company information. Power BI has many connectors to go fetch the data from Azure SQL , Log Analytics or Application Insights , we can bring all this data together and correlate all of them.